Another long day driving. But the campsite in Jinja, over looking the White Nile is a really good one and most of us have upgraded to the dorms. 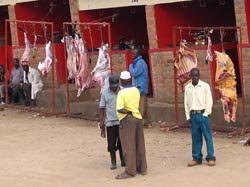 The picture is of one of the many "outdoor butcheries" we passed in Uganda. I'm not sure I'd be very comfortable eating that meat that's been hanging out in the open for who knows how long - even if it had been cooked after that.